NOW i know where to send my husband. He loves to stand in front of the fridge for long periods studying the inside. WHen i ask him what he's looking for, he invariably says "nothing". Finally, i can tell him where to go!! WV: imist, the stuff that runs down your cheeks when you're having an emotional moment. If I look in there can I see what my kids did at School today? I recognized this immediately because months ago I saw it in a patient emergency room at the hospital where I was stuck for hours. 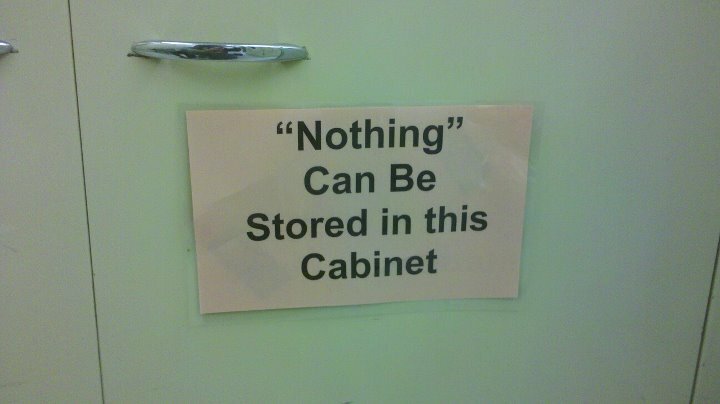 There was not anything in that room to look at so I was left staring at this sign. Unfortunately I did not have a camera at the time. 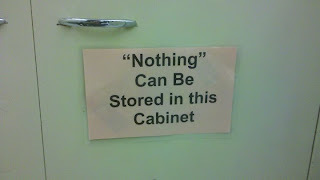 Today at the hospital, I tried to find out what "nothing" is but the cabinet was empty.